Herald Journal has a variety of popular blogs, news logs and a Community Forum online at its newspaper web site  but who are the people behind the online posts? The answer is a variety of talent from every walk of life. 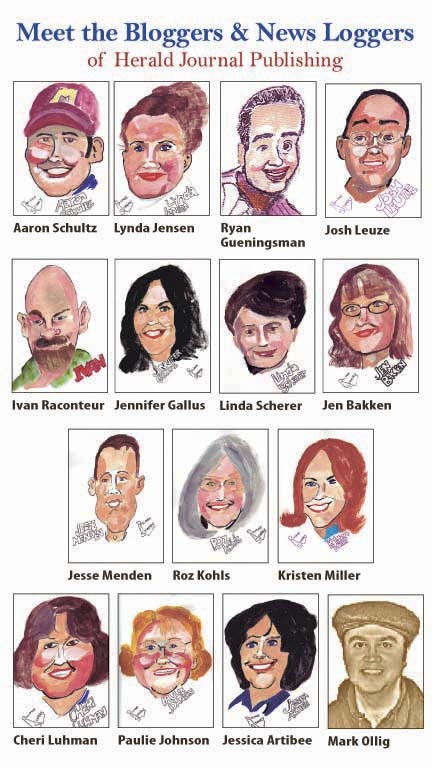 A caricature of each blogger is provided, courtesy of Delano cartoonist Rollie Starry. To see the caricatures, click here. • Aaron Schultz, the soon-to-be married pitcher for the Winsted Wildcats. He is easy-going and mild mannered, but hates whiners. Schultz is the Herald Journal sports editor. • Lynda Jensen, mother of three, including a baby and teenager at the same time. Hobby? Gardening. Jensen is the editor of Herald Journal and the Enterprise Dispatch. • Linda Scherer, a Baby Boomer with salt and pepper hair, is near retirement. Her hobby is her kids. “They are my life,” she said. She is a staff writer for Herald Journal. • Jennifer Gallus, a farm girl who wears three-inch heels and keeps herself busy with two young boys. Perpetually positive, she can see the upside of anything. Gallus is a staff writer for Herald Journal. • Ivan “The Curmudgeon,” Raconteur is a writer and columnist whose wry and unapologetic observations of human nature make poseurs cringe and the enlightened cheer. His hobbies include home-brewing, wine-making, and challenging mediocrity. • Mark Ollig, a dapper computer genius extraordinaire who is formerly from Winsted. He is a wizard on the computer. • Jesse Menden, is the “boy next door,” who doesn’t have a temper, and is patient in nearly everything. Amazingly single. He is the sports editor of the Enterprise Dispatch. • Roz Kohls, a grandmother from Glencoe who loves to stir the pot. An up-front ultra conservative. She is a staff writer for the Enterprise. • Kristen Miller is energetic, upbeat, and has a great sense of humor. She is the most fashionable person at the newspaper. Miller is a staff writer for the Enterprise. • Paulie Johnson is a spirited, red haired firecracker who works in customer service. • Josh Leuze, our webmaster. He’s been labeled as the “Most Intelligent Person who Works at the Newspaper,” and continually holds the belief that he can teach the rest of us CODE and other Internet related mysteries. He is probably crazy due to the aforementioned subjects. Josh doesn’t appear to have a temper. Patient and kind. • Jessica Artibee is a graphic designer at the newspaper, and is the youngest blogger on staff. She is a single gal, who is easy-going, creative and wins the hearts of her co-workers with fantastic food and treats. • Jen Bakken is a devoted volunteer at Delano Schools and a single mother of three children who can’t sit still. She tries to find the humor in life’s little battles, and watch hockey whenever possible. Bakken is a staff writer for the Delano Herald Journal. • Cheri Luhman; bubbly and effervescent. She has positive momentum that is hard to evade. She enjoys school sports and is a booster in life, not just for one game. She works in customer service. • Ryan Gueningsman is the youngest bachelor at the newspaper who grew up around Winstock in Winsted. He has an easy-going demeanor, and is the editor of Delano Herald Journal. Are you curious about this motley group of individuals? Then venture forth and see for yourself by clicking here for the forum or clicking here for the blogs, which will lead you to the proper directory. Note: The new Community Forum more than doubled its online views in the past 10 days, reaching a total of 7,400 Friday. This forum, as well as the Blog, is moderated, which means that potential personal attacks and other inappropriate items are deleted before they are posted.